MCQ Software is an integral part of the online examination system which allows to build and construct Multiple Choice Question Software. Our Online Question Builder assists to build and persists Multiple Choice Questions to the database and broadcast to schools for practice and a final examination. Similarly, the examination board can use the same technology for building multiple choice questions for national Eleven Plus, Final School and Pre-University qualifying examinations. Exam Builder and MCQ Software works in harmony to get the best possible school exam papers. MCQ, as it stands, should allow multiple answers with a number of right answers and number of wrongs answers permutations totalling to the number of answers designated to the questions. It has two images associated with the question description and six images associated with answers descriptions. There are up to two question images and should be used on a need basis where the question needs pictorial representation, similarly, the answer has six images and should be used with the precaution as both of them affects bandwidth and the speed during the examination. We have included a combination of up to 8 images to allow the best optimization. It’s totally dependent on schools and the examination boards. Question Bank Software with multi-lingual questions and answers for international schools and educational places makes it one of the best MCQ Software available today, allowing questions to be designed, built and persisted in the number of languages. A multi-lingual plugin must be installed on the desktop or mobile devices. With Multi-lingual capabilities helps schools where one foreign language is compulsory, they can make the best use of it. MCQ is totally functional on mobile devices and tablets as well as allowing students to use it remotely and when convenient. English, Mathematics, and Science are compulsory subjects nowadays in the majority of the educational establishment and having a combination of visual as well as the written text for question and answers with no restriction built into the system. It makes it very flexible and extensible MCQ System and gives examining boards and our student the best software online. MCQ Software allows adaptive marking for schools and colleges where different weighting can be applied to an individual answer capturing the in-depth knowledge on the subject. Also, to complement the knowledge difficulty level is engraved with every question. Examiners have full freedom over to designate difficulty level as of question demands. Online MCQ Software is able to distinguish the different level of difficult questions and allocate them on a random basis giving students a surprising level of the element to bring out the best for competitive examinations. Negative marking can be harmful and discerning, to safeguard negative marking accidentally MCQ Software can apply negative marking override flag preventing accidental marking and providing an extra level of security. Negative Marking is becoming a trend in the banking, financial and academic institutes where they want to focus on the accuracy of the answer selected to see the student’s competence level and in-depth knowledge. It is adaptive allowing to set a number of attributes for questions. Tick all right answers, no negative marking, and positive marks are few of the examples. A similar type of rules applies to Single Choice question Software regarding positive and negative marking. 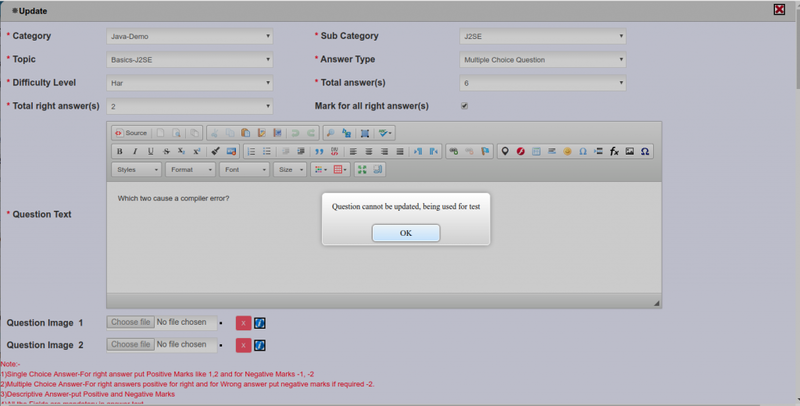 MCQ Software should be able to provide multiple answers facility to any type of questions. It should be able to publish and share questions on different topics seamlessly across the entire nation for all the examination boards. MCQ mark allocation to be totally configurable and flexible allowing to examine any difficulty level of students. Should be available for all the subjects and in multiple languages. For advanced students where 100% accuracy and full knowledge is must for an organization, our MCQ Software provides negative marking, if a student does not tick all the correct answer then full negative marks apply if selected. 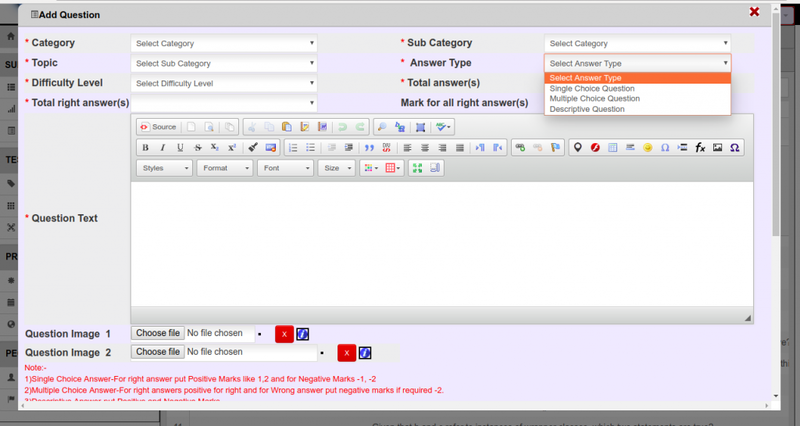 MCQ Software with positive marking and the negative marking makes it interesting where examiner needs to think of questions and answers very carefully. Full weight and negative marking impact should be taken into full consideration otherwise it will be detrimental to the students. MCQ Software has the bulk loader facility. Our MCQ Examination Software has a well-defined template in the excel format where organization, schools, colleges or university can populate and submit to our question bank software loader. Our MCQ Software will create a category, sub-category, topic and difficulty level automatically and build multiple choice questions MCQ. MCQ Software allows historical questions to be added to the organization question bank software where students can use MCQ and practice it before taking an examination. It is designed with the extensibility in the mind with the cloud-based technology. It allows any number of size or shapes questions to be part of the examination. MCQ allows bulk question loading facilities for the past examination boards question which makes it very popular amongst school colleges and universities. MCQ is also tailored for school tests and assessments and quizzes. There is no limit or restriction where MCQ software can be used its functionality meets all the educational needs and widely used across multiple examination places. Our Exam Software and Online Test Software both use MCQ Software for test and exam papers.